Complementing my daily blog interviews, today’s Author Spotlight, the eighty-sixth, is of Christian and cozy mystery author Kathryn Jones. Kathryn has been a published writer since 1987. She has published various newspaper stories, magazine articles, essays and short stories for teens and adults. She is the author of: “A River of Stones”, a young adult fiction novel dealing with divorce published in 2002, and “Conquering your Goliaths—A Parable of the Five Stones”, a Christian novel published in January of 2012. 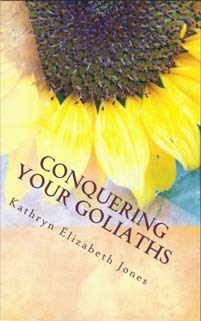 Her newest creation, a “Conquering your Goliaths—Guidebook”, was published in February of 2012. I used to believe in writer’s block. It was a good excuse for not writing; kind of like the excuse I gave (and still give) for neglecting to mop my floors. I hate to mop floors because it takes so much time, and I used to have writer’s block because it took so much time to come up with something to write about. No more. I have a binder filled with magazine pictures that I find interesting in one way or another. Most of them are ads. The great thing about ads is the words used to define the picture, words that help me to get started on my writing. The picture helps too because I can visualize a scene associated with it. One of my favorite pictures is of a man and a woman at the spa. Both have cucumbers on their eyes and a drink on a small end table to quench their thirst. They both seem content, but I can’t help wonder if the man is as content as he seems. Is it macho for a man to go to a spa, even with his wife? Would he really put cucumbers on his eyes? Thoughts like these get me writing. A book is a good resource for ideas. Just open the book to any page and point to a sentence without looking at it. These are the first few words of your short story or novel. Just now I picked one up. It read: “Mama kept glancing at Mary Toy and finally dabbed at her face with a lace handkerchief” (Cold Sassy Tree, Page 53). The idea here is not to actually use the line you point to in your final draft; it’s to get you thinking about your own story. When was the last time you rode the bus? When was the last time you wrote about what others said while traveling, how the city looked from the bus windows, and who got on and off the bus? This is a great exercise to get your writing moving. The last time I did this exercise, I came away with two story ideas—the first I wrote almost entirely on the bus. It was about a young girl’s conversation with a homeless man and her offering of her coat to keep him warm during the bitter winter. Not believing in writer’s block is only half the battle in writing your next piece. The other half must be filled with options to get you writing again. Something all writers want. You can find more about Kathryn and her writing via her website: http://www.ariverofstones.com. The blog interviews will return as normal tomorrow with sci-fi and fantasy paranormal author Caron Rider – the three hundred and seventy-fifth of my blog interviews with novelists, poets, short story authors, biographers, agents, publishers and more. A list of interviewees (blogged and scheduled) can be found here. If you like what you read, please do go and investigate further. And I enjoy hearing from readers of my blog; do either leave a comment on the relevant interview (the interviewees love to hear from you too!) and / or email me. You can sign up to receive these blog posts daily or weekly so you don’t miss anything… and follow me on Twitter where each new posting is automatically announced. You can also read / download my eBooks and free eShorts at Smashwords, Sony Reader Store, Barnes & Noble, iTunes Bookstore, Kobo and Amazon, with more to follow. I have a new forum and you can follow me on Twitter, friend me on Facebook, like me on Facebook, connect with me on LinkedIn, find me on Tumblr, complete my website’s Contact me page or plain and simple, email me. I also now have a new blog creation service especially for, but not limited to, writers. Unfortunately, as I post an interview a day (amongst other things) I can’t review books but I have a feature called ‘Short Story Saturdays’ where I review stories of up to 2,500 words. Alternatively if you have a short story or self-contained novel extract / short chapter (ideally up to 1000 words) that you’d like critiqued and don’t mind me reading it / talking about and critiquing it (I send you the transcription afterwards so you can use the comments or ignore them) 🙂 on my ‘Bailey’s Writing Tips’ podcast, then do email me. They are weekly episodes, usually released Monday mornings UK time, interweaving the recordings between the red pen sessions with the hints & tips episodes. I am now also looking for flash fiction (<1000 words) for Flash Fiction Fridays and poetry for Post-weekend Poetry.